A growing number of news organizations invited to meet this week with Attorney General Eric Holder to discuss the Justice Department's guidelines governing security leak investigations that involve reporters are refusing the invitation citing the meetings' off-the-record status. A Justice Department official said on Wednesday that meetings with select bureau chiefs will be off the record to "best facilitate the candid, free-flowing discussions we hope to have in order to bring about meaningful engagement." 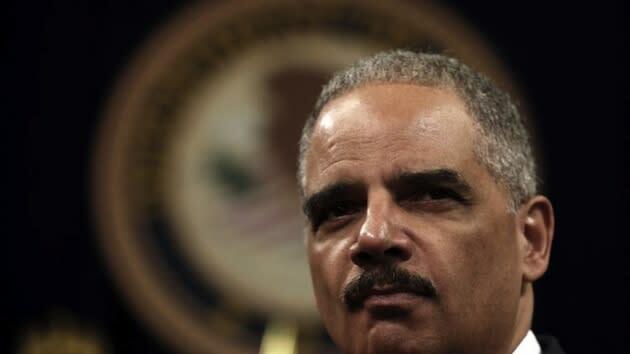 Holder called the meetings this week as part of a department review directed by President Barack Obama after controversy over the secret seizure of Associated Press reporters' and editors' phone records and secret monitoring of Fox News reporter James Rosen. But by Thursday afternoon, Reuters, Fox News, CNN, McClatchy and Huffington Post had joined the Associated Press and The New York Times in deciding to boycott the meetings due to their off-the-record status. "I told folks that I'd be happy to participate if the meeting were on the record. And I offered to bring our First Amendment lawyer with me," McClatchy's Washington bureau chief James Asher wrote in an email to Yahoo News. "So far, no response." "We would welcome the opportunity to hear the attorney general's explanation for the Department of Justice's handling of subpoenas to journalists, and his thoughts about improving the protections afforded to media organizations in responding to government investigations, but believe firmly that his comments should be for publication," Reuters spokesperson Barb Burg said on Thursday. "CNN will decline the invitation for an off-the-record meeting," the cable news outlet noted in its coverage of the meeting on Thursday. "A CNN spokesperson says if the meeting with the attorney general is on the record, CNN would plan to participate." Erin Madigan White, the AP's media relations manager, said in a widely circulated statement on Wednesday that "if it is not on the record, AP will not attend and instead will offer our views on how the regulations should be updated in an open letter." "It isn't appropriate for us to attend an off-the-record meeting with the attorney general," New York Times Executive Editor Jill Abramson said in a statement. Asked Thursday if the White House supports holding the meetings off the record, White House Principal Deputy Press Secretary Josh Earnest, during a Q&A with pool reporters aboard Air Force One, referred questions on the ground rules for the meeting to the Justice Department. "They're the ones who are conducting the review. But we are hopeful that media organizations will take advantage of the opportunity to constructively contribute to this process," Earnest said. When asked a question suggesting that holding these meetings off the record is hypocritical, he said, "No, I don’t actually see that." So, who is going to the meetings? Jerry Seib, Washington bureau chief for The Wall Street Journal, wrote in an email to Yahoo News late Thursday afternoon that "at this point, I’m planning to attend." He declined to comment on the boycott. Los Angeles Times/Chicago Tribune Washington, D.C., bureau chief David Lauter will also attend, a spokeswoman confirmed on Thursday to Yahoo News. Representatives for the The Washington Post have told news outlets they will attend. And Politico is also rejecting the boycott. "As editor in chief, I routinely have off-the-record conversations with people who have questions or grievances about our coverage or our news gathering practices," John Harris wrote in an email. "I feel anyone—whether an official or ordinary reader—should be able to have an unguarded conversation with someone in a position of accountability for a news organization when there is good reason." The Justice Department did not respond to Yahoo News' request for comment on Thursday on the boycott.